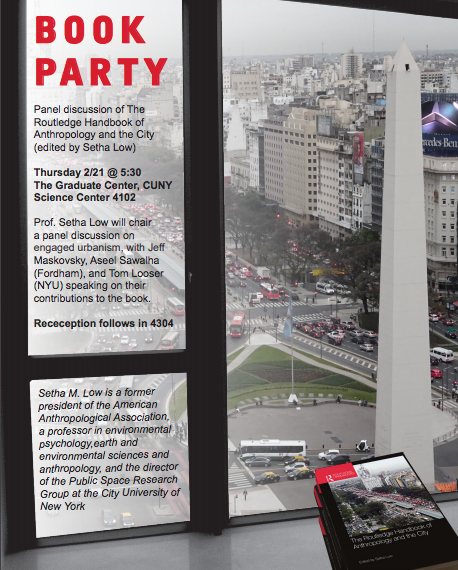 Environmental Psychology at The Graduate Center » Book Launch 2/21 Anthropology and the City! 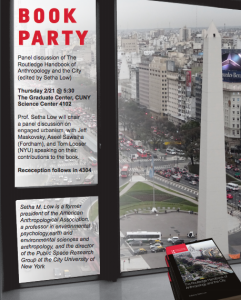 Book Launch 2/21 Anthropology and the City! Prof. Setha Low (GC EP Professor) will chair a panel discussion on engaged urbanism, with Jeff Maskovsky, Aseel Sawalha (Fordham), and Tom Looser (NYU) speaking on their contributions to the book. Reception follows in Room 4304. Please click HERE to see the poster!